Laura Doyen is the owner and founder of Design and Wine Crafting Workshops. Design and Wine holds classes for first-time and seasoned crafters where they’re guided through a creating experience. During her 20’s and 30’s Laura found herself going through a lot of life transition. No stranger to hard work, she was on the lookout for ways to make a little extra income. 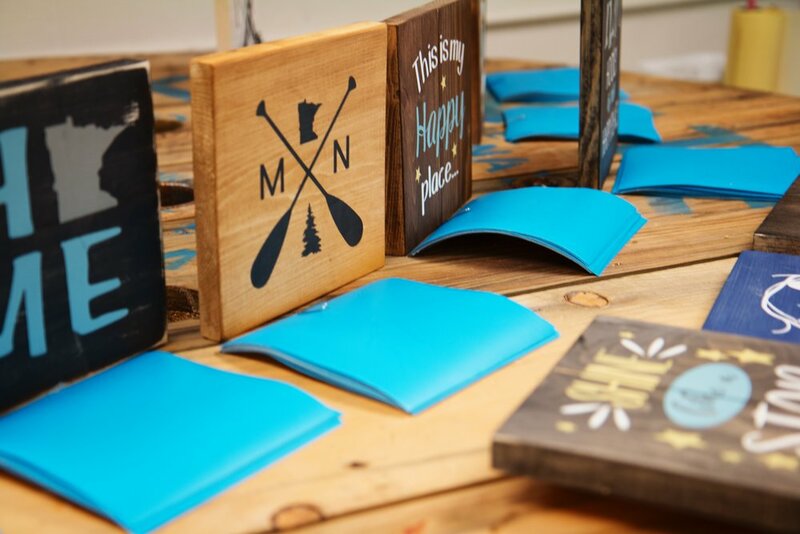 One night she happened to attend a paint night with her sister-in-law and immediately thought, “Mankato needs this!” From there, Design and Wine was born, and became a full fledge in-demand business! Read on to learn how Laura manages her time, runs her business, and goes all in personally and professionally. Tell is about Wine and Design. We are a crafting workshop that guides first-time and seasoned crafters through an afternoon of creating. 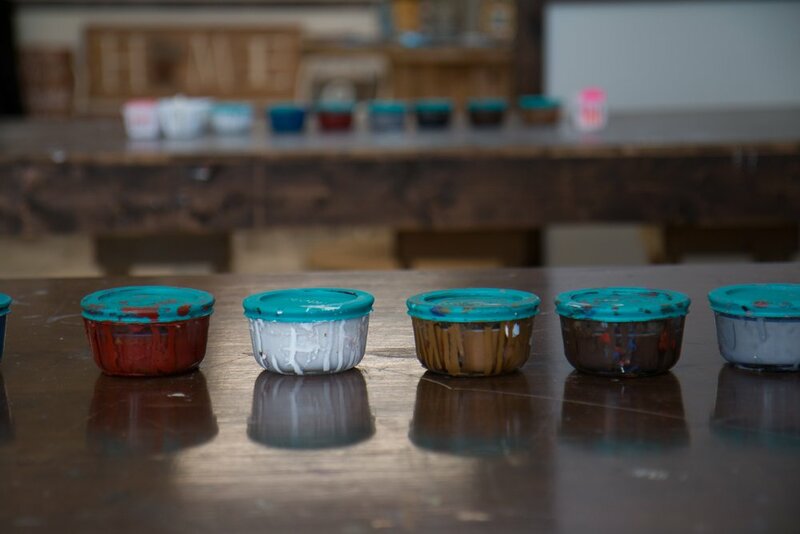 We offer specialty workshops, wood pallet sign workshops, string art workshops, canvas painting workshops, mixed media workshops and more. Design & Wine provides all supplies and step-by-step instructions for creating a unique craft. My first job was at 16 working in the Chalet of Mount Kato, the downhill ski resort in my area. What I learned from that job was not everyone likes to work, and there are some lazy people in this world. I worked in the legal field for 11 years as a legal assistant until April 2017. In my mid 20’s, I signed up to sell Thirty-One Gifts as a part-time job. I was pretty shy and anxious at that time in my life. One of my friends commented that signing up to sell Thirty-One was the best thing I did for myself. I came out of my shell and felt more comfortable around crowds, and I learned that I was good at it! I found myself as a single Mom who needed more income. I attended a paint night with my sister-in-law, Shauna, in her hometown. Later I thought, “Mankato NEEDS this!” After talking with my parents, I launched my Facebook page. Within twenty minutes, a gal I didn’t know reached out and scheduled a canvas painting workshop. Thinking I was going to be happy having just two events a month, I found I was hosting 15 – 20 events a month! For the first two years, we were strictly a traveling canvas painting business. Since then, we have opened our physical studio and added a wider variety of workshops. I stumble out of bed and head straight to yesterday’s coffee still in the pot. I microwave a cup and wash my face. The kids get rustled out of bed, and we all get ready for the day. Then I drop the kids off at school and go back home to finish up my last 15 minutes of getting set for the day. I head to my studio to cut vinyl, stock, answer emails or I head to the garage to work on pallets. Later, I pick the kids up from school, spend a couple of hours with them, and head back to the studio to teach a workshop. I have been fortunate career-wise, I’ve never had a real hard time. The most difficult time in my personal life was the transition from my 20’s to my 30’s when I got divorced. You become a little lost for a short period when that happens. What you thought your life was going to look like as a teenager and into early adulthood is nothing close to what it becomes. It feels gross to go through a divorce, but in the end, you survive, and it turns out to be a blessing. Some people are lucky enough to find themselves again, discover their passion for life, and come out better off in the end. I was blessed with a beautiful little girl from that marriage, and she was my driving force to make a great life for the two of us. I think I have done a pretty good job so far. Go all in – head first. Jump and jump hard! If your gut says you can do it, you can do it! I wouldn’t say determination is a skill, but I am very determined to have a happy career, family, and comfortable life. My life outside of my business revolves around my husband, Ryan, and our three kids: Layla, Mackenzie, and Chase. We spend a lot of time together going on adventures. Pontoon rides and bonfires at the cabin are regular things for our family. We also love getting together with friends for dinner and catching up when our schedules open up. I don’t think it ever feels balanced; I would say it’s more like organized chaos. I work hard at my job to make it successful, and in turn, the smoother it runs. The more trusted people are a part of my team, the more time left for me to spend with family. I can’t choose one! We do a lot of local fundraising in Mankato. Some of my favorite groups we have worked with are the Pedal Past Poverty Committee, Mankato West VEX Robotics Committee, and Team Lyn MS Walk. What age do you want to retire at? In a perfect world, 55! One travel location on your bucket list? A family trip to Hawaii. It depends on the situation and crowd; I think I’m both. What is your favorite blog, podcast, or book? My favorite podcast is BOSSMOM.